1Other includes other segments, inter-unit eliminations and consolidation adjustments. 3Capital expenditure excludes the effects of borrowing costs, includes capitalised finance leases and capitalised decommissioning liabilities. *Including short-term commercial paper and call loans of R31 billion (2017: R7,6 billion). I Cash generated from operations amounted to R34,9 billion (2016: R31,0 billion), an increase of 12,6% from the prior year. The Company borrows on the strength of its financial position and has maintained an investment-grade credit rating, confirming its solid stand-alone credit profile. K Transnet repaid borrowings amounting to R41,0 billion, which related predominantly to loans, bonds and commercial paper that matured during the year. Freight Rail achieved remarkable operational and financial results, posting 226,3 mt in 2018 volumes compared to 219,1 mt in the prior year (3,3% increase). This performance is despite the subdued economic climate characterised by low GDP growth and lower-than expected commodity prices negatively impacting demand. Freight Rail’s revenue for the year increased by 11,7% to R43,7 billion (R39,1 billion), mainly due to a 3,3% increase in volumes, complemented by an increase in the average R/ton at R186,75 in 2018 (2017: R174,95 R/ton). The 6,7% average increase in R/ton was mainly attributable to the prioritisation of a high-yield commodity mix. Iron, steel and scrap metal increased by 11,2% to 9,9 mt (2017: 8,9 mt). The container and automotive business grew by 6,5% to 9,8 mt (2017: 9,2 mt), suggesting continued success in market-share growth arising from the road-to-rail modal shift. Product unavailability, plant breakdowns, extreme weather conditions, community unrest blocking train operations, and the impact of infrastructure-related crimes on the Freight Rail network resulted in lower performance in other sectors: granite decreased by 25%, domestic coal decreased by 7% and cement and lime decreased by 7%. The average wagon turnaround time for general freight improved by 5,6% to 10,1 days (2017: 10,7 days). Freight Rail railed a record 77,0 mt of export coal (2017: 73,8 mt), 4,3% higher than the prior year. This achievement includes a monthly record throughput of 7,2 mt in the month of September 2017. 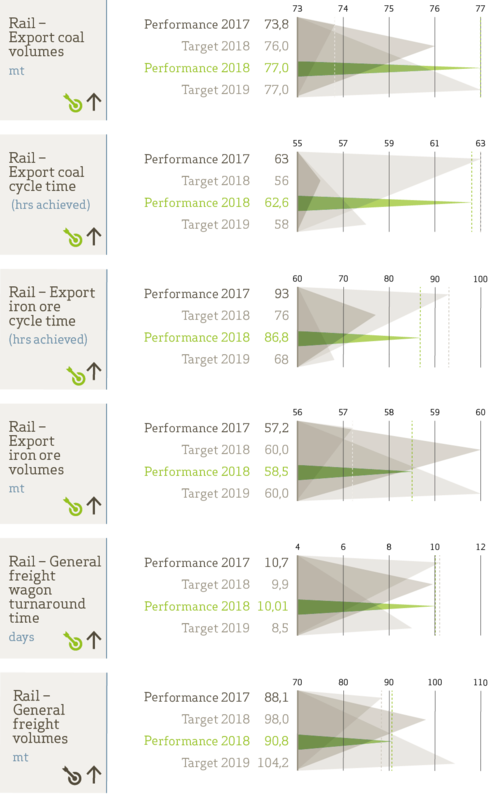 The wagon cycle time on the export coal line improved by 1,7% to 62,6 hours (2017: 63,7 hours). While extreme weather conditions disrupted rail operations during the financial year, export iron ore volumes increased marginally by 2,3% to 58,5 mt (2017: 57,2 mt). Also, numerous safety incidents, particularly mainline derailments, resulted in volume losses. 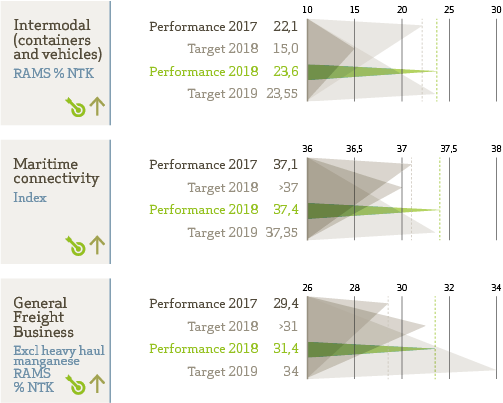 However, continued efforts to improve efficiencies yielded positive results, such as the 3,9% improvement in wagon turnaround time to 86,8 hours (2017: 90,3 hours). 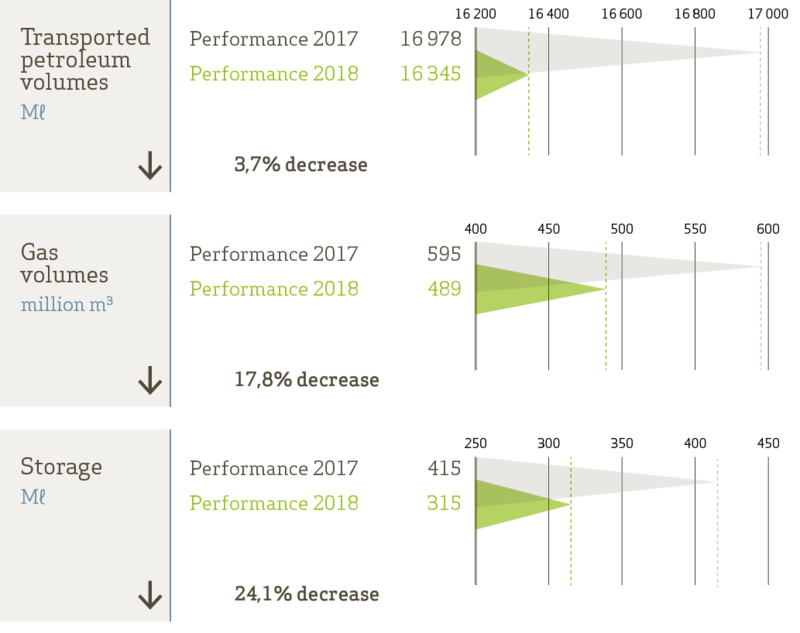 Volume performance reflected an improvement across all sectors. Container volumes increased by 6,1% to 4 663 888 TEUs, exceeding the budget by 6%. Bulk and break-bulk volumes combined increased by 4,3% to 102,2 mt, however, volumes fell 2% short of the 2018 target. The automotive sector had an increase of 3,6% to 704 052 units. Volumes in the container sector were boosted by a positive economic environment, which has resulted in increased demand for containerised goods. 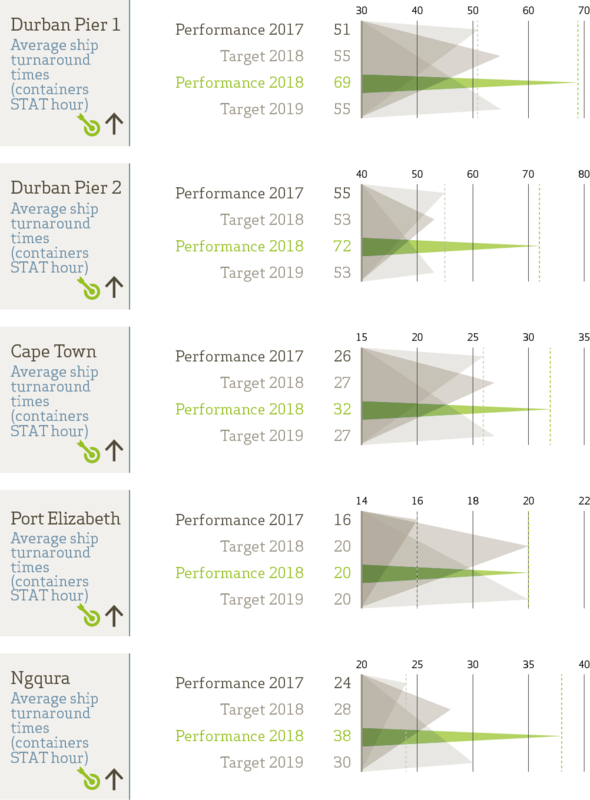 Durban, Port Elizabeth and Ngqura container terminals have significantly outperformed their expected volumes. Bulk and break-bulk volumes were boosted by high-performing manganese and iron ore volumes, but adversely impacted by declining magnetite volumes. The increase in the automotive sector was due to favourable market conditions, however, the market is showing signs of decline. Pipelines’ revenue for the year, including clawback and levy, increased 3,1% to R4,5 billion (2017: R4,4 billion), mainly due to the 1,4% increase in petroleum allowable revenue granted by the National Energy Regulator of South Africa (Nersa) in its 2018 Tariff Determination. 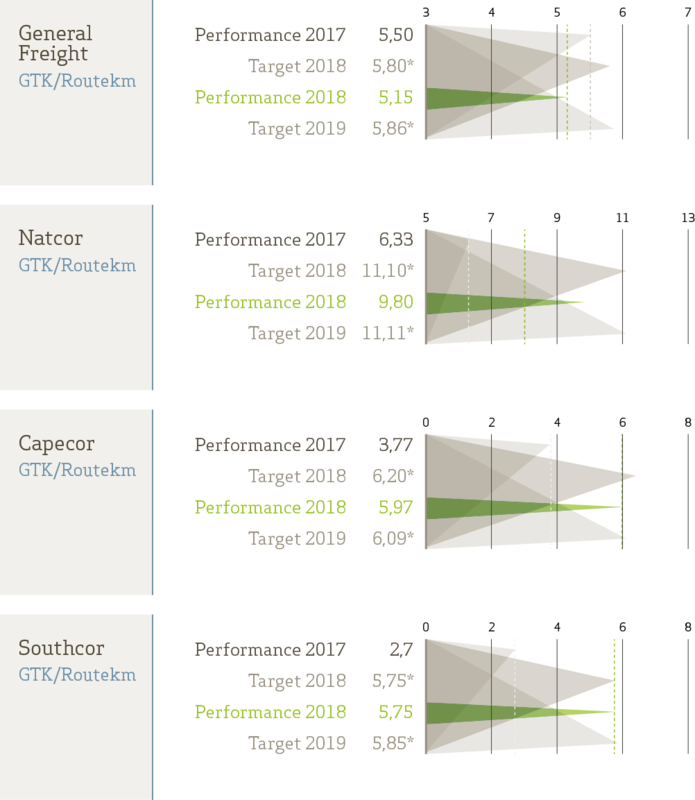 The favourable distribution pattern from the coast, and the unwinding of clawback raised in the previous financial year added to positive revenue performance, albeit partially offset by the lower crude volumes transported during the year. The petroleum volumes transported for the year decreased by 3,7% to 16 345 million litres (2017: 16 978 million litres), mainly due to the shutdown of Natref Refinery, which negatively impacted crude volumes transported, and the lower demand for refined volumes in the current economic environment. On 31 October 2017, Pipelines filed its Petroleum Pipelines System Multi-Year Tariff Application for the 2019 and 2020 tariff years. Pipelines filed for a tariff increase of 35,6% for 2019 and a tariff increase of 10,0% for the 2020 financial year. Contrary to the multi-year tariff application, Nersa will set tariffs for one year only. On 15 March 2018, Nersa informed Transnet that it has set the Petroleum Pipelines System tariffs that will allow Pipelines an effective tariff increase of 19%, resulting in an increase of approximately 6,57 cents per litre (c/l) in the petroleum transportation levy for the Durban to Alrode destination. Pipelines awaits the publication of the reason for Nersa’s decision. On 1 August 2017, National Ports Authority submitted its tariff application for the 2019 financial year to the Ports Regulator of South Africa, requesting an average tariff increase of 8,5%. The Ports Regulator published its Record of Decision on 1 March 2018 granting National Ports Authority an average tariff increase of 2,5%. In line with the multi-year tariff manual of March 2017, the Ports Regulator projects that the indicative overall average tariff adjustment for the 2020 and 2021 tariff years will be within the 6% inflation target band. On 29 March 2018, the Ports Regulator published the Methodology for the Valuation of the National Ports Authority Regulatory Asset Base (Asset Methodology). The main issue in the Asset Methodology is that the Ports Regulator has determined not to recognise the Starting Regulatory Asset Base, which was informed by the depreciated optimised replacement cost valuation methodology. Instead, the Ports Regulator will treat assets as follows: trended original costs will be applied to new assets (post 1990) and those with capitalisation dates (pre-1990) will be treated on a historical cost basis. Density is a function of volumes transported over the network. General freight volumes, although reflecting 3% growth on prior year, were below target due to economic, customer and operational factors. General freight volume performance hindered the achievement of the overall general freight density target. *The key performance indicators which include distance and mass in their calculations have been rebased, therefore, the 2018 actual cannot be compared to prior year actuals. 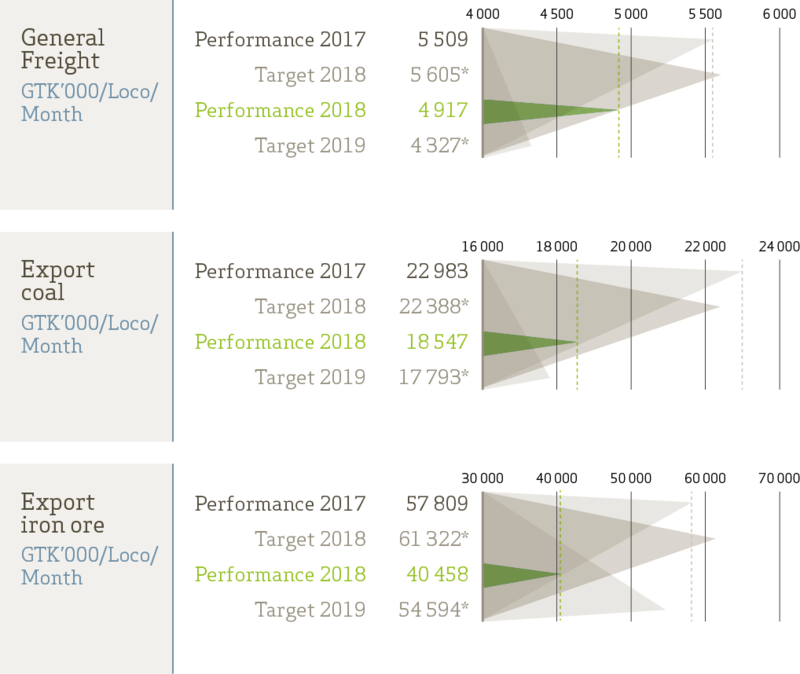 The 2018 targets were determined before the rebase. The 2019 targets have also been rebased. The General Freight locomotive utilisation performance was due to both lower than projected volumes being railed due to customer train cancellations and to operational factors such as the poor reliability and failure of older locomotives. New locomotives were commissioned into operations and were simultaneously operated along with older locomotives. The operation of both old and new locomotives is a necessary practice to keep the system stable while the process of commissioning new rolling stock into service is underway; before retiring the older locomotives. This does however result in a negative impact on locomotive utilisation performance results. Freight Rail envisages an improvement in the targeted performance of locomotives in the future due to the gradual retirement of old locomotives from the system. Significant improvement of efficiencies will be realised over the next two to three years, following the full deployment of new 1 064 locomotives and as the old locomotives are retired. Export coal achieved a historical record of 77 mt exceeding volume projections. The 2018 actual cannot be compared to prior year actuals because the mass and distance measurements have been rebased. It is projected that similar coal tonnages will be railed in 2019. 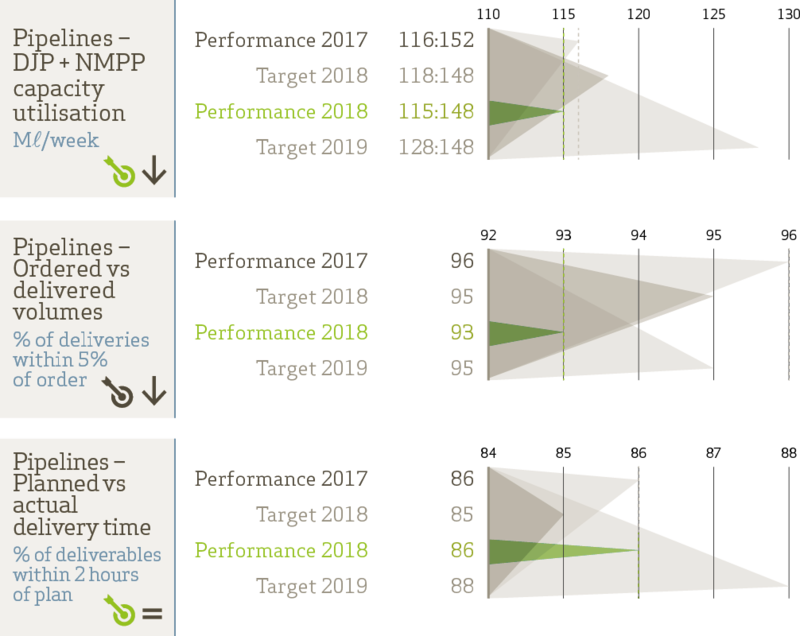 Additional and new locomotives are scheduled to be deployed resulting in the 2019 target being lower than 2018 actual. The locomotive efficiency will be improved in subsequent years as old locomotives are expected to be phased out. The export iron ore line locomotive utilisation was impacted by lower than projected tonnages recorded due to unforeseen customer cancellations; tippler off-loading challenges; and derailments in the network. The 2018 actual cannot be compared to prior year actuals due to the mass and distance calculations being rebased. 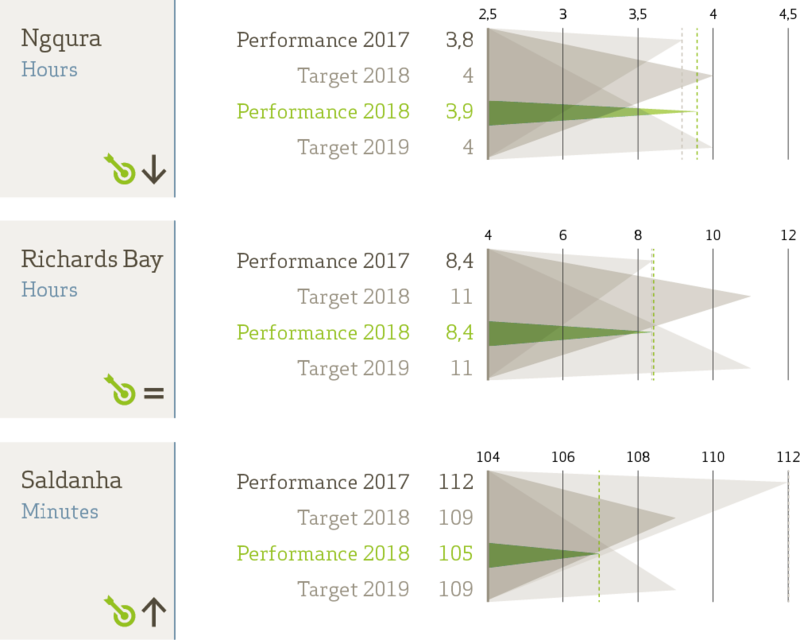 A greater target has been set for 2019 to accommodate the new manganese service on the iron ore line which will further improve locomotive utilisation on this corridor. The overall target for containers was achieved mainly due to increased transshipments resulting from an incentive agreement reached with Mediterranean Shipping Company (MSC). Freight rates for the North/South trade recovered slowly, and volume growth from regions like China, North and South Asia increased by 4,9%, 6,8% and 6,3% respectively from the prior year. The strengthening Rand also assisted in increasing import volumes. The price for some commodities recovered along with demand, while commodities such as manganese have started moving in containers again. Break-bulk volumes exceeded the budget mainly due to the high rice demand, as well as the increased cement imports from Pakistan due to its cheaper price. Liquid bulk volumes improved due to the increase in exports on the back of the strong Rand. Dry bulk volumes achieved target mainly due to the high demand for manganese, which exceeded budget by a substantial 46,6%. This offset iron ore volumes that could not meet target due to low production in the mines. Coal reached target marginally due to the efficient infrastructure provided by rail and improved marine Services. The target for vehicles was achieved due to increased transshipment within the Port of Durban. Further, transshipment of agricultural vehicles and machinery increased to the African region. VW Amarok was also transshipped for three months to the African region as demand increased. Port Terminals’ primary measure of operational efficiency, i.e. average moves per SWH, declined across most container terminals. 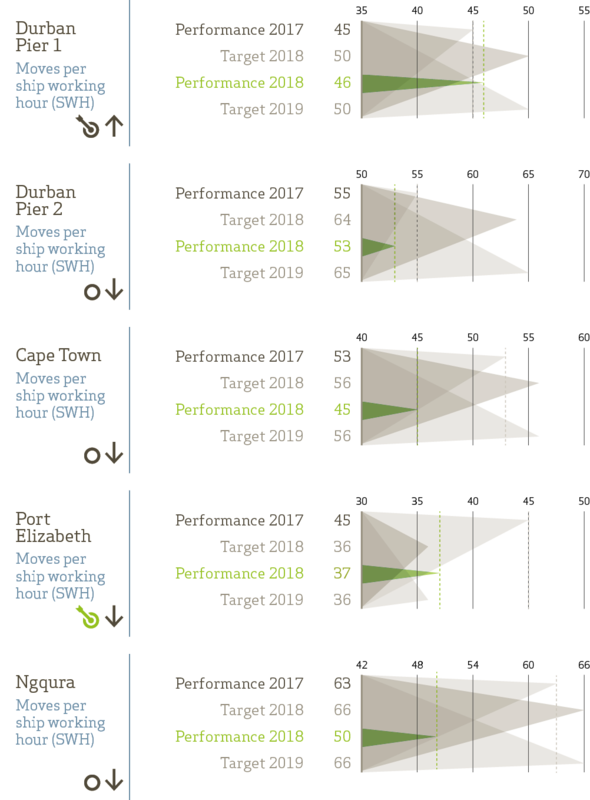 Pier 1 Container Terminal in Durban, however, improved SWH performance marginally from 45 to 46 moves per ship working hour, despite the impact of the October storm on equipment and operations. DCT’s Pier 2 SWH declined primarily due to low availability and reliability of key equipment as well as congestion during the bumper reefer season in the first half of the year. In the latter half of the year, operations were impacted by a severe storm, which damaged equipment and reduced the terminal’s operational capacity. The terminal recovered from this incident, with performance in the last quarter reflecting significant improvement. 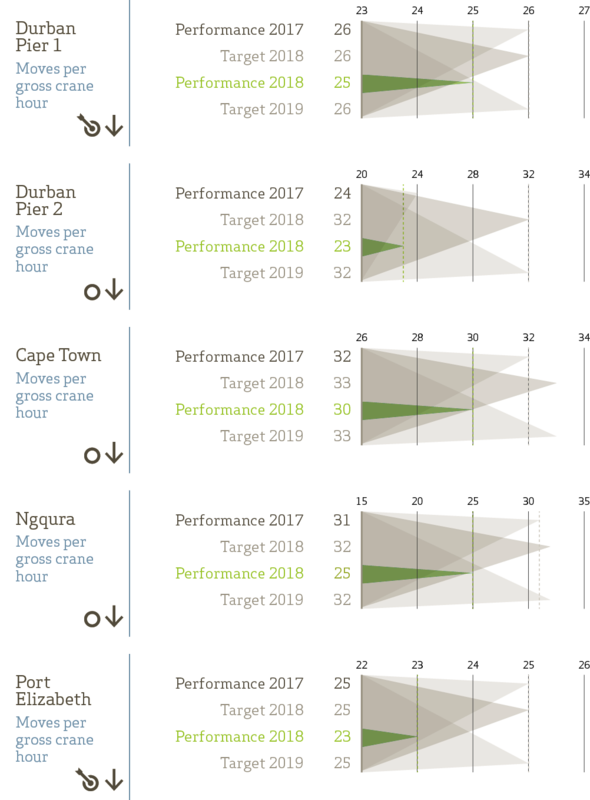 The Ngqura Container Terminal’s SWH decreased due to severe weather conditions and limited human resources, while the Cape Town Container Terminal SWH declined, primarily due to poor weather conditions and challenges in equipment reliability. Port Terminals will work to improve and sustain operating performance in Ngqura and Cape Town in 2019 through weather mitigation strategies as well as improved human resourcing and planned maintenance. The average moves per Gross Crane Hour (GCH) declined by 12% to 25 (2017: 28) and did not achieve the 2018 targets across the container terminals. Reasons for this include the poor reliability and availability of key operating equipment; the impact of the October storm on the DCT’s operations and a significant deterioration in weather conditions. 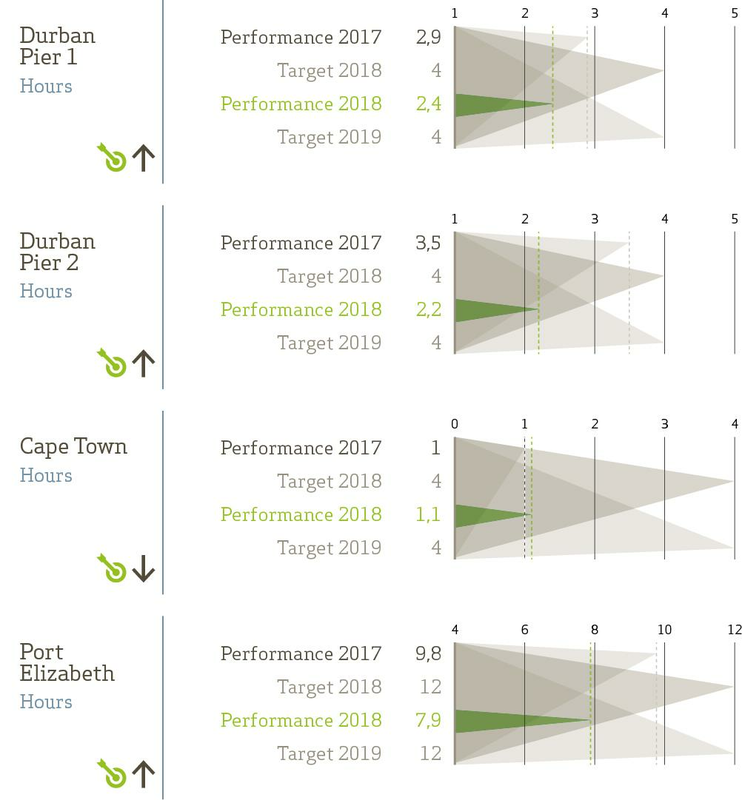 The container terminals have maintained their train turnaround time below the targeted four hours in 2018 while the bulk terminals have also maintained their train turnaround times below the targeted 109 minutes at Saldanha, 11 hours at Richards Bay and 12 hours at Port Elizabeth. The average truck turnaround time was 40 minutes against a target of 35 minutes. 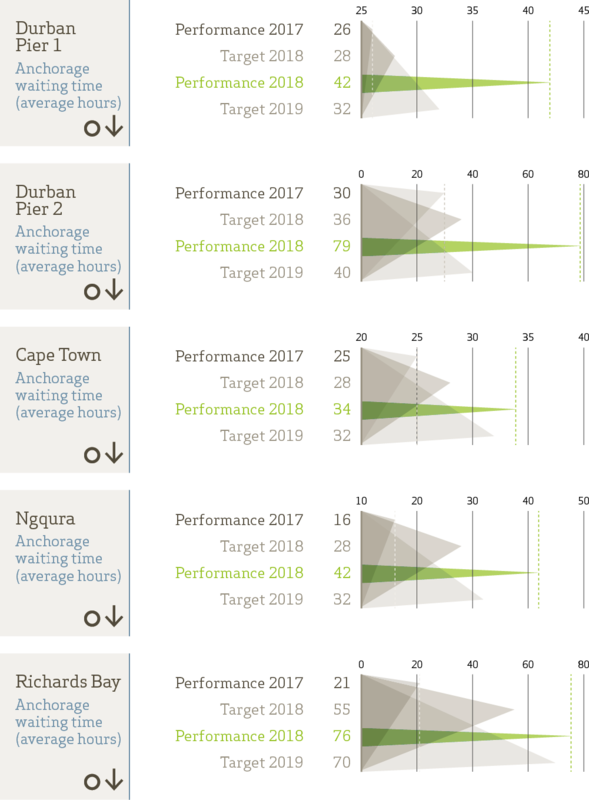 This adverse variance was attributable to truck turnaround time at Durban Container Terminal’s (DCT) Pier 2, which was slowed by equipment challenges. Poor weather conditions have impacted the Cape Town and Ngqura terminals. 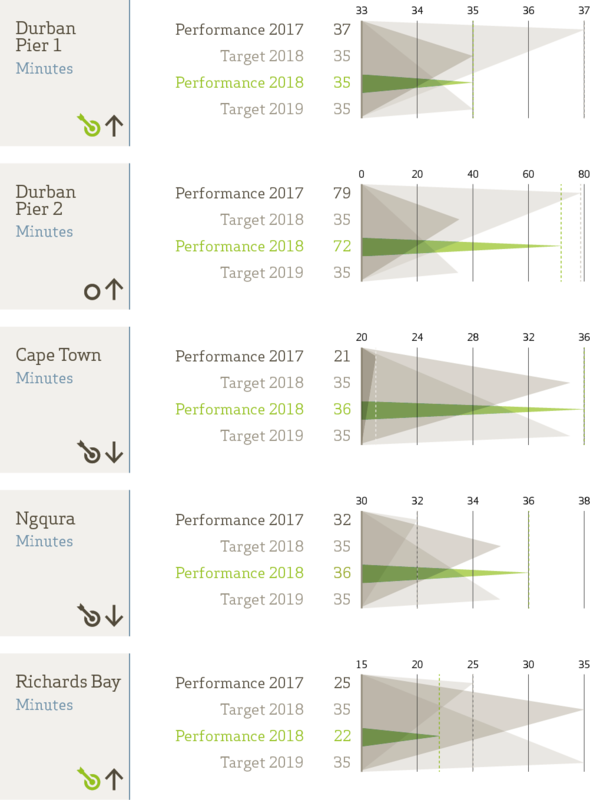 Main factors affecting performance included a major storm in the Port of Durban; adverse weather conditions during the year; operational delays leading to a build-up at anchorage, resulting in vessels waiting longer for service; and vessels arriving ahead of schedule. The petroleum volumes transported for the year decreased by 3,7% from the prior year to 16,345 million litres. Capacity utilisation for the pipeline network has been negatively impacted by the current economic environment. Further, the Natref Refinery shutdown has impacted the crude pipeline utilisation. 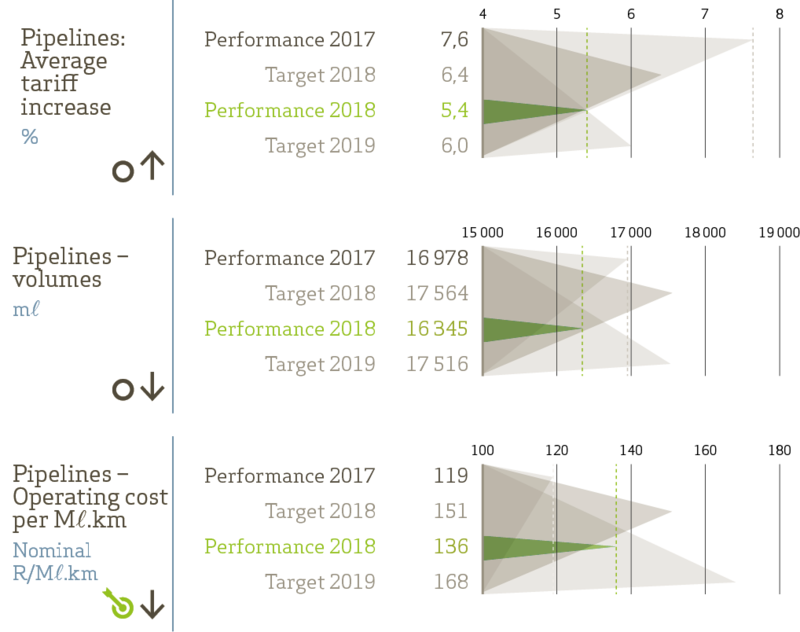 Pipelines’ operational cost per megalitre kilometre (Ml.km) of R135 per Ml.km is lower than the target of R151 per Ml.km due to cost management initiatives implemented during the year. During the year, we progressed our Transnet 4.0 ICT strategy, with various ongoing projects to drive digital enablement as we transition to Transnet 4.0. Three key business drivers form the backbone of the ICT strategy: the right to disrupt, service excellence and operational reliability. Figure 14 provides a snapshot of our digital roadmap, which outlines our active digital portfolio and the various technological elements currently being considered by the Company. Technologies such as the Internet of Things, machine learning and Artificial Intelligence (AI) will provide valuable insights into improving operational reliability and service delivery to customers, whereas blockchain technology will bring about new platforms for interacting with customers, while modernising legacy customer-facing processes. The aCTES system – which will serve as an industry-wide service platform – will help to bring about an active and continuous aggregation of relevant transportation and logistics data from multiple sources across the entire transport ecosystem, thereby radically improving our customers’ experiences across the logistics value chain. Transnet acquired 219 new locomotives (215 deployed to operations in the financial year) for the general freight business. R7,3 billion was spent on locomotive contracts for the period under review. The remaining R197 million was spent on maintenance and repairs required due to such incidents as pantograph hook-ups; minor vandalism (cable theft): third party claims; minor modifications: and minor component change-outs on various locomotives. 364 CR wagons to be used within the mining sectors to transport ore from shafts to processing plants, and for servicing the automotive market. For the 2018 financial year, 1 250 coal containers and 682 wagons were built and received by Freight Rail resulting in a capital investment of R1 billion. South Africa accounts for 75% of globally identified manganese reserves and 31% of manganese exports by value, making it a sustainable, lucrative supply market to Europe and China. The purpose of this project was to expand the capacity beyond 5,5 mt by constructing various loops, including the Spytfontein loop extension, Kraankuil loop, Beaconsfield (AC Staging Line), Beaconsfield – Spytfontein, Heuningneskloof, Poupan, Potfontein – Houtkraal, Kor – Kraankuil and Rosmead nearing completion with level crossings still to be completed. To date, Transnet has invested R2,1 billion in the project, with R212 million invested during the year. The coal line is the main channel for export coal, commencing from the mines in Mpumalanga and stretching through the Overvaal Tunnel all the way to the Port of Richards Bay Coal Terminal (RBCT). To date, Transnet has invested R2,8 billion in expanding capacity on the export coal line to 81 mtpa. For the year ending 31 March 2018, the Company invested R55 million in the upgrade of yards, lines and electrical equipment. The Waterberg region has 40% of South Africa’s remaining coal reserves and is regarded as the next strategic growth node of the coal sector. The availability of infrastructure is critical to unlocking the region’s potential and is a prerequisite for current and future mining developments. Stage 2, which refers to capital investment to grow capacity to 6,3 mtpa through incremental upgrades of the existing rail networks and yards by using additional loops, maintaining the existing 20 axle loads and level crossings, strengthening steel bridges, doing electrical upgrades and improving train control systems. Stage 3-5 feasibility study aims to develop an engineering solution to meet validated demand and to increase capacity to 24 mtpa. Since inception, Transnet has invested R164 million in the project, with R98 million invested for the year. The long-term sustainability of the Overvaal Tunnel is a challenge due to its age and it also only provides for a single rail line. Transnet is currently finalising an optimal solution to replace the single line tunnel by either providing a new double track tunnel adjacent to the existing tunnel or a double line deviation to by-pass the tunnel. The key motivations for this investment are to protect revenue generated on the coal line, and to enable Freight Rail to maintain the current throughput. The NMPP is a strategic investment to secure the supply of petroleum products from the coastal terminal in Durban to the inland (predominantly Gauteng) market over the long-term. It is one of the largest and most complex multi-product pipelines in the world. R1,3 billion was invested in the NMPP project during the year. The coastal terminal (tight-line solution), inland terminal , 24” main pipeline and 16” inland pipelines have been fully commissioned and are operational, having transported more than 199,48 billion litres of diesel from Durban to the inland region since commissioning. Following the coastal terminal commissioning in August 2017, the pipeline is now operating as a multi-product pipeline (various grades of diesel and petrol) functioning at full phase 1 flow rates, thereby securing fuel supply for the South African economy over the medium to long term. The inland terminal was commissioned and became fully operational in December 2017. Providing capacity ahead of validated demand remains a key strategic intent for Transnet. As Transnet transitions to Transnet 4.0, Port Terminals and National Ports Authority have plans to invest in infrastructure and equipment to unlock demand as well as to contribute to the economic development of South Africa. For the year ended 31 March 2018, Transnet has invested approximately R2 billion for the maintenance and acquisition of cranes, tipplers, dredgers, tugs, straddle carriers and other port equipment. The development of Maydon Wharf berths in the Port of Durban and a new port administration building in the Port of Ngqura were also completed during this year. Transnet has initiated a project to enter into a financial and technical partnership with qualifying private sector sponsors and empowerment partners to design, finance, build and operate the LNG import infrastructure, regasification and storage terminal and integrated transmission pipelines to form a Natural Gas Networks infrastructure backbone between KwaZulu-Natal and Gauteng by 2023. The total capitalised maintenance for the year ended 31 March 2018 amounted to R6,8 billion, of which R2,3 billion was invested in interventions to sustain the Company’s rail infrastructure, with R4,5 billion invested to maintain the condition of the rolling stock at a sustainable level. The launch of the TransAfrica Locomotive during April 2017 marked a crucial step in our strategy of becoming a leading manufacturer and supplier of rolling stock in Africa. The locomotive, designed, engineered and manufactured in Africa, is suitable for use on branch lines and in the yard for shunting, while also being able to travel on old rail tracks originally designed to carry light axle loads. In addition, the diesel-powered TransAfrica Locomotive is appropriate for aged railway lines that operate on the Cape Gauge system, offering a cost-effective solution for the majority of the continent’s railway lines that are currently unused. The device has a ‘cow-catcher’ at the front to remove small obstacles on the track, like stones. Six engineers spent 18 months developing the concept and working on the prototype in collaboration with the Council for Scientific and Industrial Research. There is nothing like SID in the world. What makes it unique is that there is no driver, it is fully autonomous. Plans are under way to introduce SID to other rail operators and to industrialise it. Transnet is due to invest approximately R1 010 million in a new Ngqura waste treatment infrastructure project, which aims to establish South Africa as a regional and global environmental leader. Transnet is due to acquire 26% in the project, with an option for an additional 4%. A trust will be established to accommodate 5% for a BEE empowerment component. A joint venture will be established to pay National Ports Authority R3 840 000 per year, escalating at 9% per year for 20 years. Property, plant and equipment is estimated at R520 million, while the separator, vessels and trucks are estimated at R490 million. Transnet’s rail development framework aims to expand region-wide rail service capacity, while growing tonnages and capturing new market share. Rail competes with other modes such as road and pipelines. Market competitiveness for rail is measured in terms of Rail Addressable Market Share (RAMS) based on tons per calendar year. General Freight market share considered in terms of RAMS percentage per net ton kilometre (RAMS % NTK) reflected a notable improvement from 29,4% in 2017 to 31,4% in 2018. This was due to the year-on-year General Freight volume growth of 3% in a challenging business environment. Specific initiatives implemented to attract rail-friendly volumes back to rail contributed to this positive performance. 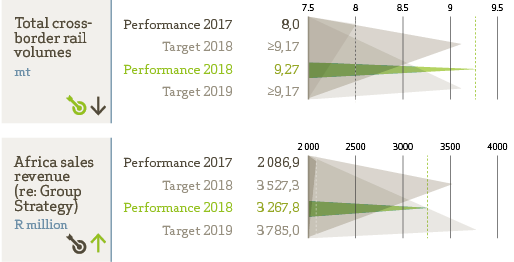 These efforts will be strengthened as the business strives to achieve a RAMS target of 34% in 2019. We have calculated that Transnet’s road-to-rail efforts has yielded a total of 147 661 off-road trips, amounting to approximately 178 million kilometers. This amounts to approximately 1 335 trucks being permanently removed from South Africa’s roads. The unemployment rate in South Africa is currently at 26,7%, which shows a negligible improvement from the 27,1% reported in 2017. 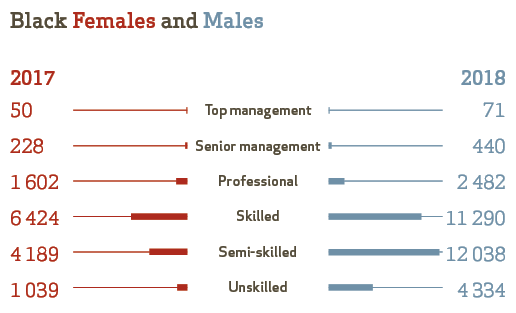 A total of 36,5% of Transnet’s workforce is between the ages of 26 to 35, which is the productive range, followed by ages 36 to 45 at 32,4%, while 2,9% are between ages of 61 and 63 towards retirement. Transnet has made a concerted effort in recent years to increase the percentage of younger employees by focusing on lower and middle management through leadership development. In 2018, the total headcount decreased from 58 828 in 2017 to 55 666 in 2018. This is attributable to the employee optimisation process undertaken in 2018. Transnet strives to build an organisational culture of connectivity, mutual respect and innovation. The Company has launched an Employee Value Proposition (EVP) using a digital platform iBELONG to connect employees directly to the Company where they can receive messaging in a language of choice, offer real-time valuable insights by completing mobile surveys and receive non-financial rewards and recognition in the form of mobile vouchers and airtime incentives. To date, approximately 1 000 employees have registered on the platform. Transnet presents the youth with development opportunities through skills training to enable them to enter the mainstream economy by becoming employed or starting their own businesses. 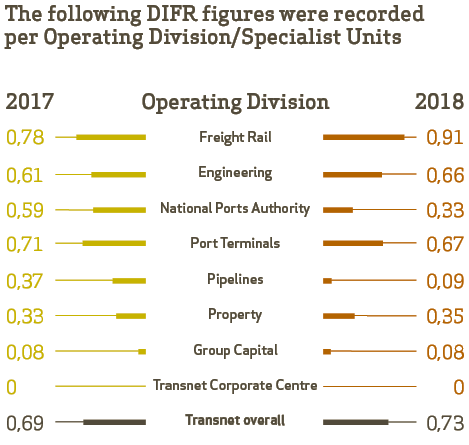 Transnet’s safety performance is measured against industry-recognised indicators, such as the disabling injury frequency rate (DIFR), which includes fatalities, loss incidents and derailments. During the year, Transnet recorded 539 disabling injuries compared to 516 reported in 2017. While our overall DIFR performance continues to be exceptional by international standards at 0,73 (2017: 0,69), we regret to report five employee fatalities during the year. Accidents at railway crossings continue to be a safety challenge for Transnet. As our rail network runs for kilometres across a large national footprint, it is prone to encroachment by informal settlements. We continue to create awareness about the dangers of railway-level crossings. Public fatalities increased to 102 in 2018 (2017: 82). However, we recorded a decrease in running-line derailments, from 81 in the prior year to 80 in 2018. Shunting derailments decreased from 159 in the prior year to 140 in 2018. This performance is an achievement of tolerance limit that was set for the financial year. The Board conveys its deepest condolences to the families, colleagues and friends of the employees and members of the public who lost their lives. We wish to reiterate our continued commitment to the safety of employees and the public as a vital component of the Company’s operations. Transnet was rated a Level 2 B-BBEE contributor in 2018 and seeks to achieve sustainable and inclusive economic growth by investing in emerging technologies and manufacturing capabilities, as well as procuring locally produced goods services. Transnet’s total recognised B-BBEE spend for the year, as per the Department of Trade and Industry Codes (the dti Codes), was R25,81 billion accounting for 86,9% of Total Measured Procurement Spend (TMPS) of R29,71 billion. 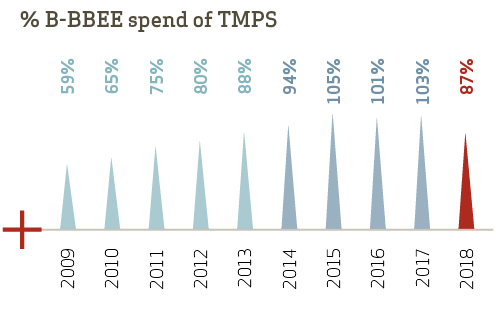 Transnet spent R12,47 billion (42,0% of TMPS spend) on black-owned enterprises; R9,34 billion (31,4% of TMPS spend) on black women-owned enterprises; R2,47 billion (8,3% of TMPS spend) on exempted micro-enterprises; and R2,69 billion (9,1% of TMPS spend) on qualifying small enterprises. 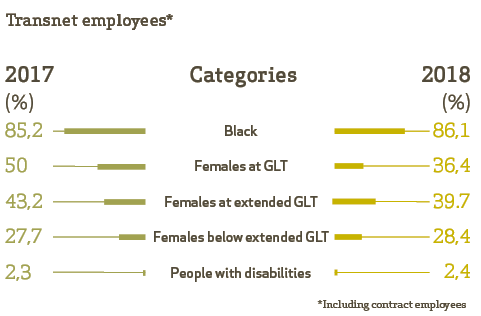 Spend on black youth-owned enterprises accounts for R224,63 million (0,76% of TMPS) while spend on enterprises owned by black people living with disabilities accounts for R24,55 million (0,08% of TMPS). 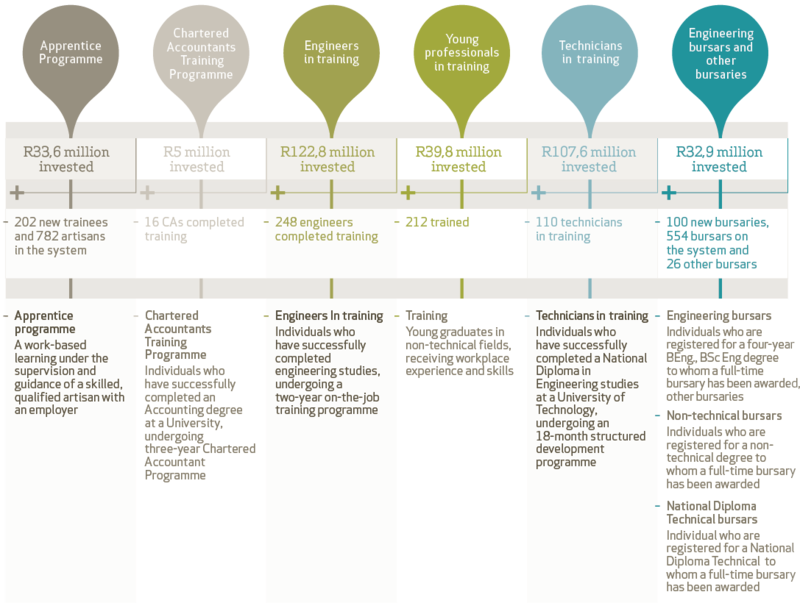 Transnet’s Supplier Development (SD) programme promotes skills development and the creation and preservation of jobs. It further encourages the transfer of intellectual property and the localisation of supply, and ultimately promotes industrialisation through contractually obligated SD plans. 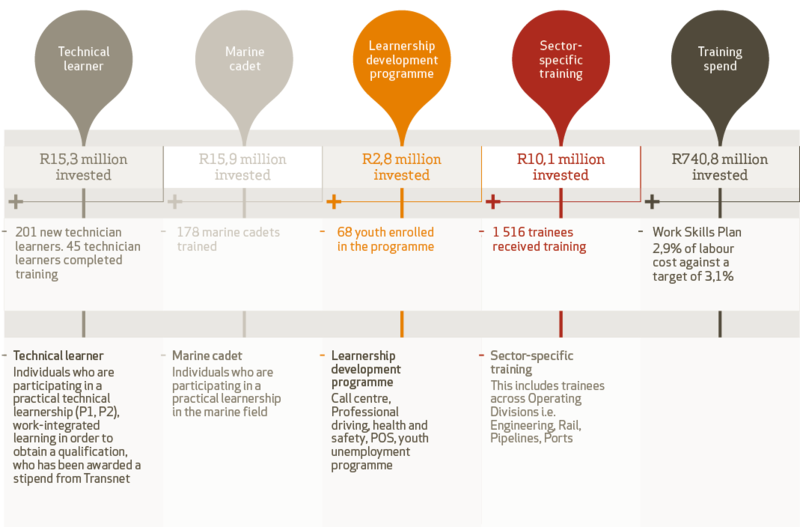 Since inception of the programme, total contract value to date amounts to R137,6 billion (2017: R134,4 billion). SD obligations concluded with suppliers amount to R63,4 billion or 46,1% (2017: R62,6 billion or 46,6%) of contract value. To date R42,5 billion or 67,0% of these SD obligations have been met (2017: R32,2 billion or 51,5%). The SD numbers include the locomotive awards and related SD obligations. While we continue with efforts to ensure we reach racial balance in our workforce, our performance in respect of employing black employees in 2018 (73,9%) was poor compared to the prior year (2017: 83,1%). The proportion of people with disabilities was at 2,4%, which shows a increase from the 2,3% in the past two consecutive years. Transnet also seeks to achieve gender equality and empower all women as espoused in the United Nations’ Sustainable Developmental Goals. Our strategic plans will continue to focus on increasing the representation of black employees, female employees and people with disabilities. Transnet’s gross value-add increased from R50,4 billion in 2017 to R56,7 billion in 2018. Private sector partnerships (PSPs) have been included in the broader delivery of Transnet’s strategy as a large-scale investment in economic infrastructure designed to support the country’s socio-economic imperatives as mandated by the DPE. To accelerate Transnet’s commercial impact on economic growth – and the development of downstream and upstream businesses – we aim to create supply chains that could link service providers from across the country and cross-border regions, while fuelling rural development and job creation. National Ports Authority invested approximately R17 million in Expressions of Interest and the market feasibility for Operation Phakisa projects. National Ports Authority further invested R152 million at the Port of Saldanha in the off-shore supply base (OSSB) Berth 205. The appointment of the private OSSB Facility Operator is in the final stages. The private sector is expected to spend approximately R200 million once the Facility Operator has been appointed. Additionally, R1,8 million has been invested to date towards the engineering prefeasibility studies for the Richards Bay Floating Dock. This project is under way. Transnet followed a section 56 of the National Ports Act 12 of 2005 process to seek and appoint private sector investors for seven projects. Section 56 agreements have been signed for four of these projects, namely: Sunrise Energy Liquefied Petroleum Gas project at the Port of Saldanha, Oil Tanking Grindrod Calulo (OTGC) Liquid Bulk Terminal at the Port of Ngqura, Burgan Cape Liquid Bulk Terminal at the Port Cape Town and the Cape Town Cruise Terminal. During the year, Transnet progressed various regional projects through Transnet International Holdings (TIH), laying a firm foundation for its geographic expansion drive under the Transnet 4.0 Strategy. The Nigerian government plans to overhaul its ageing railway system, built before independence in 1960. A General Electric led consortium (Transnet SOC Limited, Dutch-based APM Terminals and China’s Sinohydro) submitted the only bid for a Nigerian railway concession project worth approximately US$2 billion. The Award Letter was issued on 23 May 2017. The concession will cover about 3 500 km of existing narrow-gauge lines from the south-western commercial capital, Lagos, to Kano in the north, and south-eastern oil hub Port Harcourt to Maiduguri in the north-east. This will include Inland Container Depots at Kaduna, Kanu, and so forth. The Nigerian government has requested an interim solution while the parties negotiate the Concession Agreement (circa 18 months to financial close). The consortium is finalising the appropriate solution, which will focus only on the Lagos – Kano rail line. Transnet submitted a response to the Request for Proposal by the National Railways of Zimbabwe (NRZ) to raise finance for the rehabilitation and renewal of key equipment, systems and infrastructure for its railway system. The evaluation criteria was 60% financial and 40% technical, with a requirement to have an entity that understands local conditions as part of the consortium. The tender has since been awarded to the Transnet-Diaspora Infrastructure Development Group (DIDG) consortium. The joint bid is to recapitalise NRZ with US$400 million. Following a ribbon-cutting ceremony by His Excellency President Mnangagwa of Zimbabwe on 21 February 2018, Transnet launched the Project Interim Solution, a precursor to the 25-year concession envisaged to commence at the end of June 2018. The interim solution entails leasing rolling stock to NRZ while we are finalising the concession suite of documents. The Swaziland Rail Link is a 150 km green-fields rail development adjoining the rail network of South Africa at Lothair and that of Swaziland at Sidvokodvo. The project is being jointly developed by Transnet and Swaziland Railway at an estimated cost of R19 billion. Each company will be responsible for upgrading its adjoining rail networks. Transnet’s contribution to the Special Purpose Vehicle (SPV) that will develop the Swaziland Rail Link has been identified. Swaziland Railway is also assessing their contribution to the SPV. The next step, pending approval of both sponsors, is to engage investors to finalise the funding of the project. The Government of South Africa and Kenya signed the LAPSSET Corridor memorandum of understanding in October 2016. The LAPSSET Corridor has the following seven components: Lamu Port and a 700 sq special economic zone; highways; oil pipeline; railway; international ports; resort cities and oil refinery. Lamu Port will be a deep-sea port with transshipment capabilities on the East Coast of Africa and a gateway with seamless and reliable connectivity of transport systems in Kenya and to the neighbouring landlocked nations. Transnet has received a letter approving the privately initiated investment proposal on Lamu Port. The letter paves the way to commence negotiations in terms of the provisions of the Public Private Partnership Act No. 15 of 1993, for the operation of three berths in the Port of Lamu. The first berth is envisaged to be completed by July 2019, which is being constructed by a Chinese company. Transnet’s role, if successful, will be to operate the three berths through a 25-year concession. Initial investment by Transnet to operationalise the first berth circa US$25 – US$30 million. Through our human resources and corporate social investment portfolios, we are committed to measurably improving the quality of life of the communities where we operate. During the year, there were numerous incidents of community discontent (led by industry bodies, community members and business forums). Transnet’s inability to provide job and business opportunities was cited as a contributing factor. While Transnet acknowledges its role as a SOC to support and improve communities’ economic and social well-being, many of these incidents could also be attributed to the ‘inequality risk’ prevalent in South Africa, which is a major contributor to social and labour instability. Transnet recognises that we are unable to address these issues in isolation. Accordingly, we have developed a Community Investment Plan (CIP) as a vehicle to remedy current unfavourable relations, and to foster more positive relations in the long term. The CIP, approved in August 2017, provides a structured and integrated approach towards collaboration and sustained shared value, and aims to develop a self-sustainable plan to respond to community issues as they arise, thereby maintaining our social licence to operate. 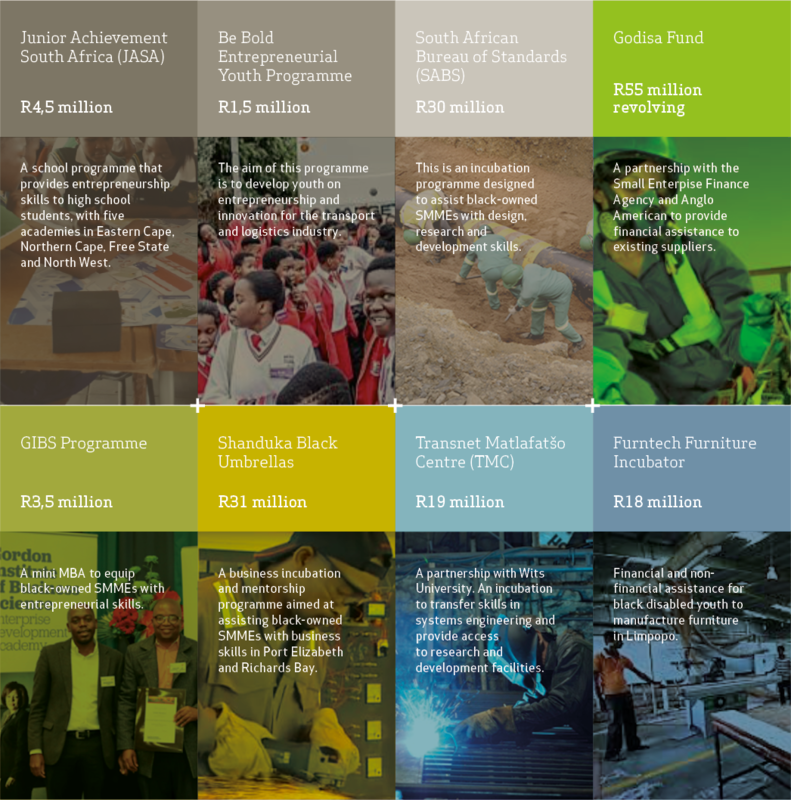 During the year, Transnet invested R219 million in sustainable community development programmes across South Africa. Transnet recorded a 2,9% increase in energy consumption, while energy efficiency increased by 0,9%. 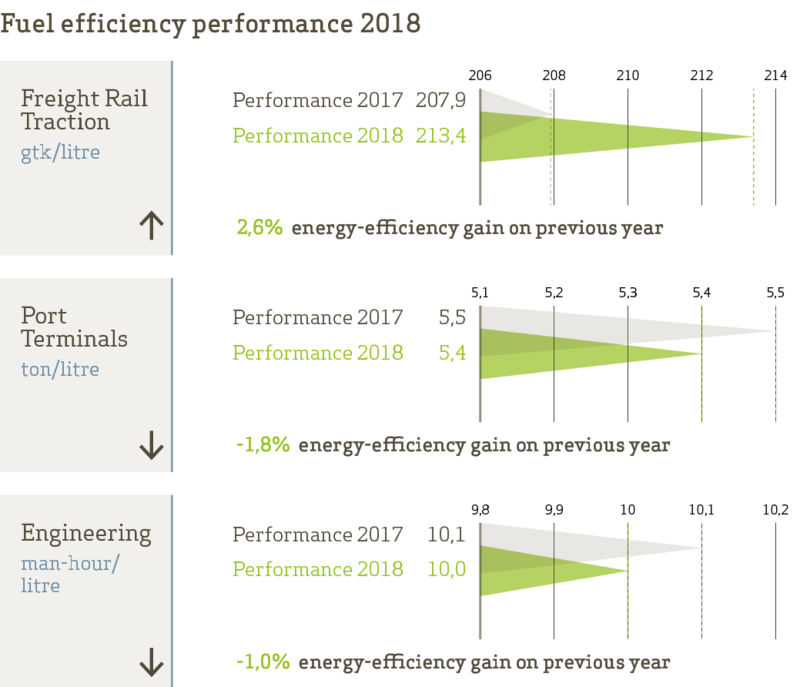 In Freight Rail traction (which constitutes more than 70% of total Company power consumption), electrical traction energy efficiency decreased by 1,4%, and diesel traction achieved a 2,6% energy-efficiency gain. The new 15E, 19E, 20E and 21E locomotives together regenerated 262 016 MWh for the year. 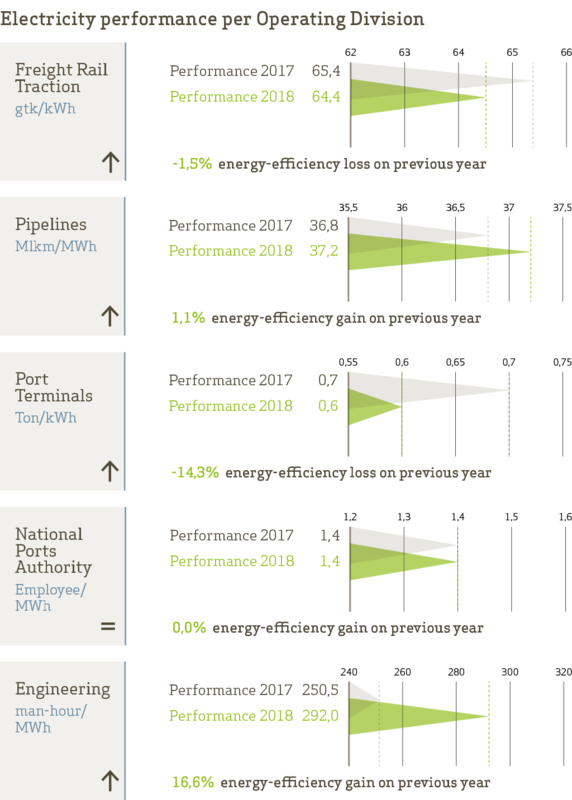 The Company’s year-to-date carbon emission intensity decreased by 2,6%, compared to the prior year, while energy efficiency improved by 0,9% in 2018 compared to 2017, measured as tons/GJ. 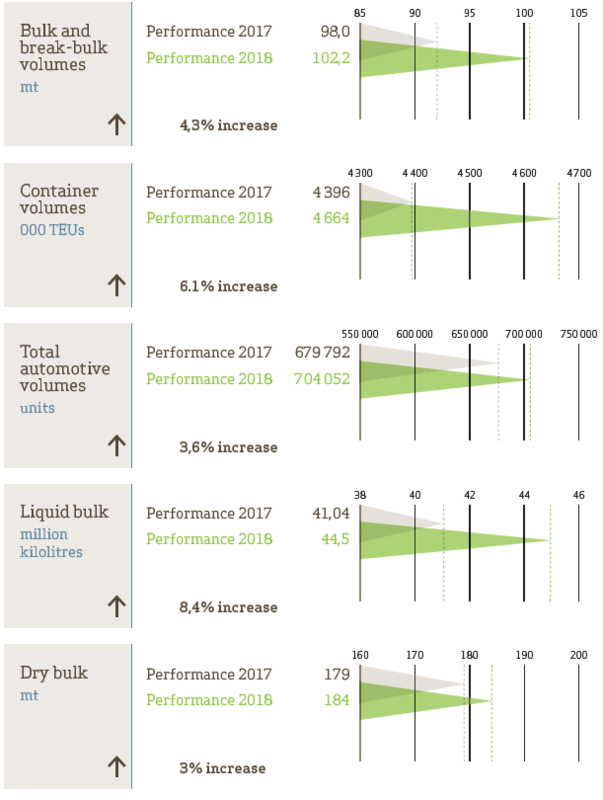 Market share gains from road hauliers in Freight Rail’s top 10 general freight commodities resulted in carbon emissions savings for the South African transport sector of 859 228 tC02e. Transnet recorded an increase of 1,1% in carbon emissions in 2018 from 3,95 mtCO2e in 2017 to 4,0 mtCO2e. Freight Rail accounts for 80% of the total GHG emissions. Natural gas has been identified as a key energy source for South Africa’s growth and transition to a lower-carbon economy, requiring enabling infrastructure. Transnet is preparing for partnerships with the private sector to establish common-user midstream Natural Gas Networks (NGN) of integrated port facilities and pipelines (for import, storage and regasification of liquefied natural gas (LNG)) and the transmission of natural gas to multi-sectoral customers in the industrial, power and transport sectors. The initial NGN project will facilitate the import of LNG at Richards Bay and access to natural gas using Transnet’s pipeline assets. Through our research and development unit within Transnet Engineering, we continue to investigate alternative energy technologies. 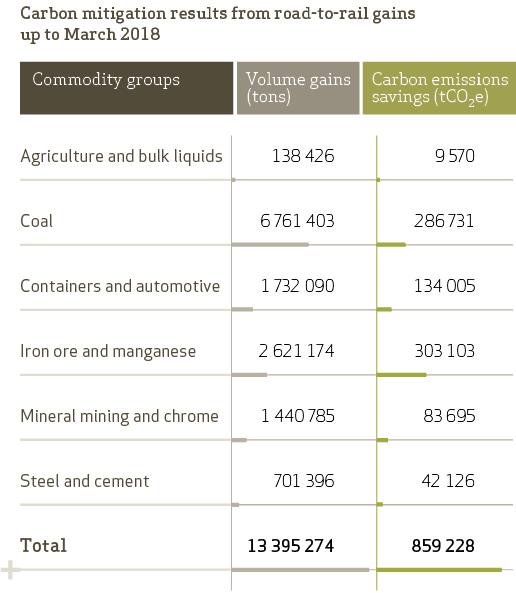 The transport sector accounts for approximately 9% of South Africa’s GHG emissions. The modal shift of cargo from road to rail offers an immediate opportunity to lower carbon emissions in the transport sector, especially for the hauling of large volumes of high-density freight over long distances, rail is generally three to five times more efficient compared to road. Additional benefits offered by rail include reduction in accidents, congestion, noise pollution and lowering of costs in the transport sector. As the owner, operator and custodian of the country’s rail freight network, Transnet has committed to increasing rail market share and to demonstrate the carbon emissions saving achieved annually through its growing market share. Freight Rail continues to make a meaningful annual contribution to the reduction in carbon emissions in the transport sector. 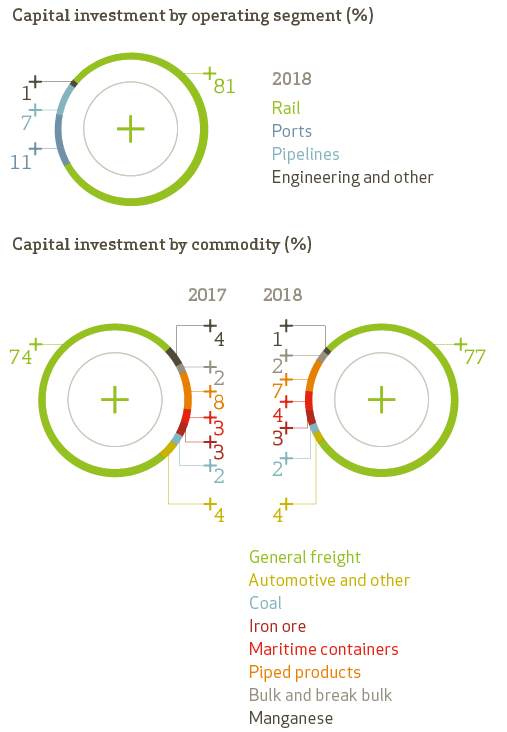 In 2018, Freight Rail gained market share in numerous commodity groups where there is strong competition with road hauliers. This rail tonnage gain amounts to ‘volumes off road’. The carbon emissions savings in road-to-rail volume gains during the year amounted to 859 228 tCO2e. The emissions savings are dependent on volumes gained and distance travelled. The current water crisis experienced across our footprint, amid drought conditions, has directed the Company to investigate and explore alternative water sources, including desalination, underground water resources as well as other innovative technology solutions. We continue to implement water stewardship initiatives such as installation of boreholes, low-flow shower heads with timers, waterless pressure testing, rainwater harvesting and water recycling to achieve water saving and reduce consumption. We also continue to engage with public and private stakeholders in key water-stressed catchments to collaboratively develop solutions. We continue to participate in the Carbon Disclosure Project: Water and achieved a ‘B’ score in 2018. Transnet recognises that issues of wastewater management and water quality have cross linkages and continues to manage the quality and quantity of effluent discharged by implementing effluent-monitoring programmes at all effluent discharge points and treatment plants across its operations. Wastewater presents opportunities to enhance sustainable development through effective wastewater treatment and reuse. We have invested R1 million at the Transnet Engineering Durban centre to install a new test area, which reuses water in locomotives in a water test facility where 60% of water is fed back into the system. Transnet also continues to address historic asbestos and hydrocarbon contamination by adopting a more integrated, cohesive and collaborative approach. Our engagements with the Department of Mineral Resources for possible collaboration in respect of asbestos remediation and rehabilitation are at advanced stages. The Company further continued with its ad hoc clean-up efforts in contaminated areas, where the asbestos exposure risk interferes with employees and the public. In 2018, 929,88 tonnes of asbestos waste was removed in ad hoc clean-up initiatives compared to 37,3 tonnes in 2017. We also invested R2,1 million to clean seven historic hydrocarbon-contaminated sites across our railway network. During the year, Transnet generated R89,4 million revenue through the recovery of scrap metal and electronic waste. This is an improvement from the two previous years (2016: R87,8 million and 2017: R70,9 million). We continue to ensure the reduction of waste generated by our operations to reduce total waste going to landfill. Following certification of the pensioners’ class action proceedings on 31 July 2015, Transnet was served with a summons on 11 June 2015 issued out of the Pretoria High Court. According to the summons, the pensioners seek an order directing Transnet and the pension funds to increase the pensions of all fund members by an annual rate of not less than 70% of the rate of inflation, with effect from 2002, as well as an order that Transnet pays a legacy debt of R17,5 billion to the funds, plus interest from 1 April 1990. Lastly, an order is also sought that Transnet pays a sum of R309,1 million to the Transnet Sub-fund of the Transport Pension Fund (TTPF) as repayment of an amount allegedly donated by the TTPF to Transnet from a members’ surplus in 2001. Transnet filed legal arguments (exceptions) showing that the particulars of claim are defective and that the plaintiffs should remove or amend their particulars. These were heard on 4 and 5 April 2016. Judgment on the exceptions upheld three of Transnet’s exceptions and gave the plaintiffs 14 days within which to amend their particulars of claim. The plaintiffs instead lodged an application for leave to appeal in respect of the judgment, followed by a petition to the Supreme Court of Appeal (SCA), then an application to the President of the SCA and finally an application in the Constitutional Court. Judgment was delivered by the Constitutional Court on 25 April 2018, effectively dismissing all exceptions against the particulars of claim. Accordingly, the plaintiffs’ particulars of claim did not have to be amended, and Transnet filed its plea, as required, within 20 days from date of judgment. In addition to the factual allegations being incorrect, the legal basis for a number of the allegations is flawed. Incidents of non-compliance with internal policies and/or provisions of the PFMA have resulted in 44 finalised disciplinary cases and the lodging of 1022 criminal cases with SAPS. The bulk of the criminal cases relate to the theft of cable and other assets from the rail infrastructure network. While goods and services were received, it is clear that the prevention and detection controls in this area are not achieving the desired level of compliance. The Board, together with management, have implemented corrective action. The Shareholder Representative has determined that the materiality limit for reporting in terms of sections 55(2)(b)(i), (ii) and (iii) of the PFMA is R25 million per transaction. In terms of this materiality framework, there are 26 reportable items exceeding R25 million which have been reported as irregular expenditure for the financial year. More detailed disclosure relating to these items, together with corrective action, is set out in Annexure E to the annual financial statements. During the year, substantive stakeholder concerns were reported across various print media, with specific reference to media allegations relating to the so-called ‘Gupta Leaks’. The loss estimates related to the ongoing litigation and corruption investigations will only be finalised when all investigations are completed. The process has been facilitated in a phased approach. Transnet’s Forensic team reviewed and analysed media reports pertaining to Transnet contracts. Letters were written to suppliers informing them about the investigation into allegations of supplier kickbacks on SOE contracts. Suppliers were requested to provide details of third-party companies and individuals that assisted to acquire business from Transnet, as well as the value of service payments made to companies or individuals, and the dates of payments. Suppliers were further required to disclose the names of Transnet employees with whom they had interacted with regards to contracts, and to disclose whether any undue influence had been applied to persuade them to pay commissions to any Transnet employees. Responses were received from three companies. Overall, 33 companies were identified in media searches, of which nine may have Transnet contracts, four may be fronting, 18 may have received funds from Transnet contracts. Altogether 15 of the companies may be international. Following the review, Transnet Forensics assessed the extent to which affected companies had complied with procurement procedures and policies as well as applicable National Treasury regulations, and the extent to which payments were made for genuine goods and services received by Transnet. Media reports of fraud and corruption allegations relating to specific Transnet employees were also investigated. Relationships were established between current and past directors through business addresses, directorships and transactions with Transnet for these companies (12 in total). Reviews of companies implicated were completed in March 2018. A criminal investigation was recommended and a case has been opened with the SAPS to establish the flow of funds between linked companies, directors and Transnet employees identified during the forensic investigation. At the time of publishing this Integrated Report, the investigation is still ongoing, with external service providers contracted to facilitate further forensic assessments and criminal investigations. The new Transnet Board has done away with the Acquisitions and Disposals Committee. This is to ensure that Transnet directors are not involved in acquisition processes. Further, the Board has established a special sub-committee comprising the chairpersons of the various Board sub-committees to advise the Board on the implementation of recommendations from externally sourced investigative reports. The Board will also seek legal advice on the uncoupling and implementation of civil, criminal and disciplinary matters. Processes under way include the investigations of the Special Investigatiing Unit (SIU) and Hawks as well as the Zondo Commission into state-capture. The dispute on the IT service contract involving Transnet on the one hand and T-Systems and Gijima on the other is receiving the Board’s attention. The focus is to get Transnet to transition from its current ‘outsourced’ data centre service environment in a manner that will enable the Company to assume internal control of these services. Coupled to the transitioning process, Transnet will continue to enhance its internal ICT capacity. The T-Systems/Gijima matter is now before the court. All issues relating to this matter will, therefore, be handled through this process unless an amicable resolution is agreed upon by all parties involved in the matter. It has been widely reported in the media that the contracts to purchase 1 064 locomotives are the subject of certain corrupt activity. This led the previous Board to initiate a forensic investigation by Werksmans Attorneys, followed by further investigative work carried out by MNS Attorneys. Transnet is aware of additional investigations into the same matter being undertaken by the SIU, the Hawks and the Zondo Commission (all investigations are at various stages of completion). As at the reporting date, there is still further work being undertaken by the new Board. Transnet is, therefore, not in a position to make a firm determination as to whether any, a portion, or all of the expenditure should be considered as non-compliant with the provisions of the PFMA and, therefore, whether such expenditure should be classified as irregular. The estimated total contract value is R54,5 billion, with cumulative expenditure to 31 March 2018 amounting to R30,1 billion. To the extent that any of this expenditure is found to be in contravention of the provisions of the PFMA, it will be reported and appropriately classified in the annual financial statements for the year ended 31 March 2019.